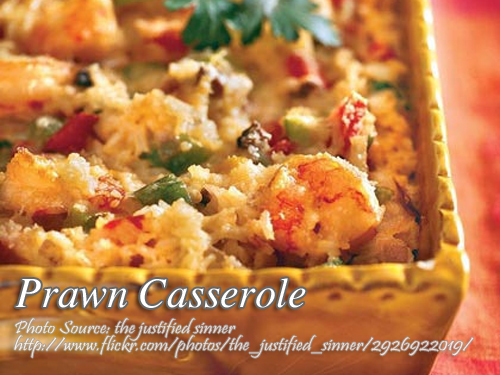 Casserole dishes are not usually cooked in Filipino cuisine because these type of dished originates in the West and in Europe. Casserole is a French term for saucepan and maybe we call pots in tagalog as “kaserola”. The way casserole dishes are cooked is by putting a stew in a casserole then baked in an oven to cook the contents slowly rather than just putting it on the stove. Since the heat is indirect, there is less chances of burning. This prawn casserole is an easy cooking dish where you just have to put all the ingredients, prawns, celery, bread crumbs, spices and seasonings. To cook prawn casserole; Cut prawns into bite size pieces if they are too big, if they are small prawns, you can use them whole. Mixed the prawns with celery, onion, mayonnaise, Worcestershire sauce, salt and pepper. Spread mixture in a butter casserole dish. Combine bread crumbs and melted butter or margarine then sprinkle over casserole. Bake in a 350 ­°F oven for 30 minutes or until lightly brown. Garnish with lemon sliced and parsley and serve hot. Cut prawns into bite size pieces if they are too big, if they are small prawns, you can use them whole. Mixed the prawns with celery, onion, mayonnaise, Worcestershire sauce, salt and pepper. Spread mixture in a butter casserole dish. Combine bread crumbs and melted butter or margarine then sprinkle over casserole. Bake in a 350 ­°F oven for 30 minutes or until lightly brown. Garnish with lemon sliced and parsley and serve hot.